Report: A terrific all-round performance by Jaipur Pink Panthers saw them thrash Dabang Delhi 36-25 in the Pro Kabaddi League contest on Sunday. Nitin Rawal and Pawan Kumar combined to score 12 raid points while Manjeet Chhillar and Sidharth scored nine tackle points for Jaipur. It was a disappointing performance by Delhi as they were second best for the majority of the match. Abolfazl scored six raid points for Delhi. Jaipur remain fifth in the Zone A table with 36 points from 11 matches. Delhi remain rooted bottom of the table with 28 points from 11 matches. Pawan scored with a two-point raid in the second minute to give Jaipur 3-0 lead. Abolfazl opened Delhi's account in the third minute. Jaipur led 5-3 after five minutes and looked like the better side. Delhi scored a tackle point in the 10th minute to level the game at 6-6. The next few minutes saw both teams exchange raid and tackle points as it was 7-7 in the 13th minute. Jaipur inflicted an all out in the 15th minute to lead 14-8. 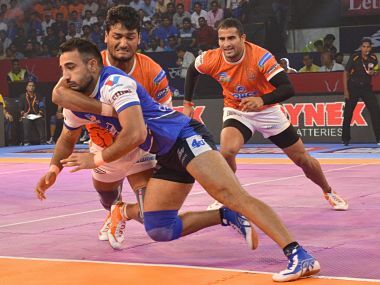 Delhi were looking a bit hapless as Jaipur went into the break leading 18-9. Delhi began the second half in the worst possible fashion as they suffered another all out in the 24th minute to trail 12-24. 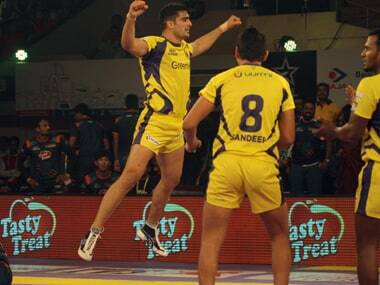 Captain Meraj Sheykh was having an off day for Delhi as they struggled to get raid points on the board. Afterwards, it was a matter of consolidating the lead for Jaipur as they coasted to the handsome win.